Thaw-It uses a unique blend of organic and two petroleum Co-Solvents to dissolve Wax and Ice Crystals that cause fuel to gel. 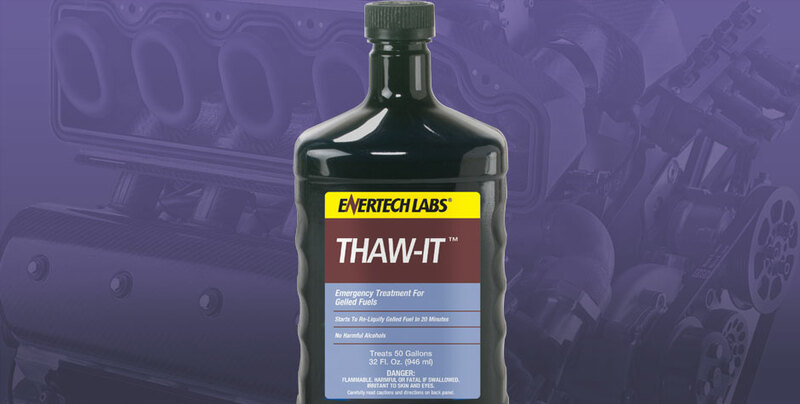 Thaw-It works on diesel fuel and biodiesel to dissolve wax and to breakdown and disperse water. Thaw-It will when used as directed, begins to work within 20 minutes and will completely re-liquefy the fuel in the entire system. Thaw-It can be safely used in #1, #2, #4, and #6 fuels. Thaw-It contains NO: Chlorinated Solvents, Methanol or other Harmful Alcohols. Remove filter and replace if possible with a new one. If you must use the old filter try to pour out as much of the ice or gelled fuel as possible http://cialisforlife.com/. Fill the filter with 50% Thaw-It™ and 50% diesel fuel. (Do not fill with 100% Thaw-It™). Add 1 quart of Thaw-It™ per 50 gallons of fuel to the fuel tank(s). Allow to sit for 20-30 minutes, then start engine. Allow engine to warm before driving or operating. Use Complete Fuel Treatment™ or Polar Flow™ to prevent fuel from gelling in the future. If you have water in your fuel system use EnerFuel to disperse water. Diesel Fuel contains paraffin wax in two forms, liquid wax that is in suspension in the fuel and wax crystals that are floating throughout the fuel. In temperatures above the fuels Cloud Point (CP) you can’t see wax without a microscope. When fuel reaches its Cloud Point wax in the fuel has begun attaching itself to the wax crystals making them large enough to be seen with the naked eye. This wax will appear as a cloud-like formation floating in the fuel.As the fuel temperature drops the wax crystals continue to get larger and will begin to stick to each other. At this Cold Filter Plug Point (CFPP) or Gel Point the fuel will have difficulty passing through fuel filters. This is the critical point at which it can become difficult or impossible to operate an engine or burner. As the temperature continues to drop the fuel can become a semi-solid, this is known as the Pour Point (PP), or the point at which fuel will no longer pour.You can prevent from fuel from gelling in three ways. Anti-Gel’s work in a similar way, when mixed with the correct amount of fuel they effectively prevent gelling, lowering the gel point by as much as 35°F. Another important thing to remember about anti-gel additives is that you have to treat the fuel before it begins to gel. Products such as Complete Fuel Treatment™ are preventatives designed to prevent gelling, once the fuel has gelled anti-gels won’t help you until the fuel has thawed. When you have fuel that is gelled, there are only two choices. One warm the fuel up, generally done by dragging the piece of equipment into a garage, or two by using a product such as Thaw-It™ to dissolve the wax and reliquefy the fuel.Thaw-It™ contains two co-solvents to break down waxes in diesel and glycerin’s in biodiesel. Thaw-It™ will also remove (disperse) liquid and dissolved water in the fuel and fuel system. Icing can result from liquid water freezing in fuel tanks, fuel lines, and fuel filters.Icing can also result when water that is suspended or dissolved in the fuel falls out of solution as the fuel temperature falls. This water first forms droplets and then those droplets turn to ice crystals which will quickly plug fuel filters. Ultra Low Sulfur Diesel holds twice as much dissolved water as Low or High Sulfur Diesel. Biodiesel holds up to 10 times as much water (up to 1%) as Low Sulfur Diesel. The amount of water that a fuel can suspend or hold dissolved changes as the temperature drops. For example a fuel that holds .2% water at 60°F can only hold 1/2 that amount at 30°F. When you have ice in your fuel, there are only two choices. One warm the fuel up, generally done by dragging the piece of equipment into a garage, or two by using a product such as Thaw-It™ to dissolve the ice and disperse the water. Thaw-It™ contains two co-solvents to break down the ice. Thaw-It™ will also remove (disperse) liquid and dissolved water in the fuel and fuel system. For best results, add contents to fuel tanks according to printed directions.Use 32 ounces for each 50 gallons of fuel (1:200 treatment ratio).Remove Fuel Filters and mix Thaw-It 50/50 with fuel, then pour balance into fuel tank(s), wait 20-30 minutes then start engine. For regular cold weather treatment of fuels, use CFT – Complete Fuel Treatment, Polar Flow, or Corona Heating Oil Treatment. Notice to Purchaser: Enertech Labs, Inc. provides no warranty of any kind with respect to the product whether express or implied including without limitation, the implied warranty of merchantability or fitness for any intended use or purpose; shall not be liable under any circumstances for any loss, damage, liability, injury or expense directly or indirectly resulting from, arising or related to the use or application of product; shall not be liable for consequential or incidental damages or loss of profits; and its liability shall be limited to replacement of the product. National Fuel contacted Enertech Labs on a cold morning in the fall due to their trucks not starting. The Enertech Labs team found that the bulk tank had gelled. Enertech Labs treated the bulk tank with Thaw It, advised the fleet manager on how to treat the individual trucks with Thaw It and within a couple of hours the fleet was back in service and the problem was resolved. I had a gelled 45kw generator that was becoming a real frustrating issue, so I used Thaw It and it quickly re-liquefy the fuel and removed the water to prevent ice crystals from returning.